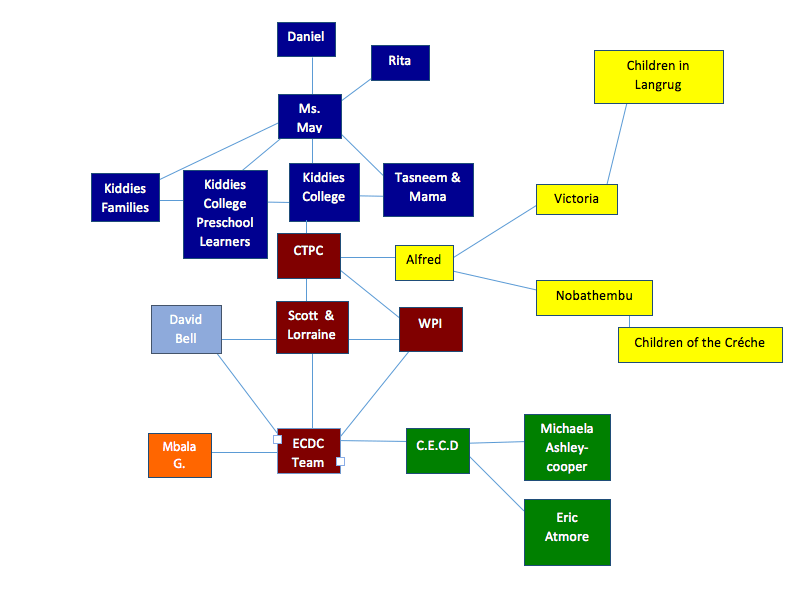 ECDC Team– The ECDC team is us, the students doing this project with Kiddies College Preschool. Our group is made up of Nicholas Deraney, Katelyn Nicosia, Julie Waddell, and Hedan Mindy Zhang. Cape Town Project Centre (CTPC)– The Project Centre is WPI’s onsite connection between us and our sponsors at Kiddies College Preschool. Scott and Lorraine– Our advisors from WPI who will be working with us at the CTPC. Kiddies College Preschool– The organization that will be sponsor of Kiddies College Collaboration and will be the main community we will be working with. Kiddies College is an Early Childhood Development Centre that services children under the age of 6 years old. Ms. May– The liaison between the Kiddies College Collaboration group and Kiddies College. She will be our group’s major connection to how we can help the Kiddies community. She is also a high school teacher working for the Department of Education. Tasneem – She is the principle of Kiddies College and will play a large role as one of the liaisons to our project. Her and Ms. May have worked in the preschool since Ms. May opened it nearly fifteen years ago. Mamma- She is the mother of Ms. May and is the cook at Kiddies College Preschool. She plays an integral role in the lives of the children as their disciplinary and their advisor. Mamma offers tough love with a bit of sweetness to follow. 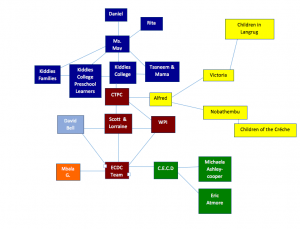 Kiddies College Preschool learners and their families– The families that make up this community come from many surrounding areas of Observatory. The majority of the learners come from the Northern Suburbs or the townships and Cape Flats. The languages spoken at home by these families include Xhosa, English, Afrikaans, Shona, French, Zulu, and some others as well. Kiddies College Preschool Too – This will be the name of the new school that Ms. May plans to open. A location in Plumstead is currently being pursued to open this business. Mbala G. – A social worker from the Department of Social Development that will assist us with questions about the registration process for Kiddies College Preschool Too. Daniel – A Real Estate agent who is assisting Ms. May in finding a location for a Kiddies College Preschool Too. Rita – The caretaker of the new location in Plumstead that we are currently looking into as a potential location for Kiddies College Preschool Too. Nobathembu– One of the community leaders in Langrug. She is also a créche owner. Her créche is located in a church in Langrug. Alfred– One of the community leaders in Langrud. Showed ECD Team around to the different créches in the community. Mainly works with WaSH team. Victoria– One of the caretakers of the Wash Facility in Langrug. She showed the Kiddies Team a créche in Langrug. Main source of communication with the caretakers in the Wash Facility. Eric Atmore– Founding director of the Center of Early Childhood Development. He is also an associate professor of Social Development at the University of Cape Town. Children of Langrug– Local children in the community that usually play near the Wash Facility. Kiddies College Preschool Learners– Students who attend Kiddies College Preschool. Ages range from 1-6 years. Children of the Créche– Children who attend Nobathembu’s créche. Ages range from 0-6 years of age. David Bell– A professor at Clark University who is from Cape Town and has a great deal of experience with education and community expansion. Centre for Early Childhood Development (CECD) – an NGO in Cape Town focused on improving Early Childhood Development through educational workshops. Michaela Ashley-Cooper– The liaison between CECD and KCC, she provided us with information about what the CECD does and general information on Early Childhood Development.